Ellen graduated from SUNY Delhi in 1996 and has worked in many sectors in veterinary medicine. She started out in veterinary technology as a student primate biohazard technician at LEMSIP in Sterling Forest, NY. After closing of the lab, she moved to shelter medicine (Humane Rescue Alliance in Washington, DC), and a few corporate small animal hospitals in the DC metro area. 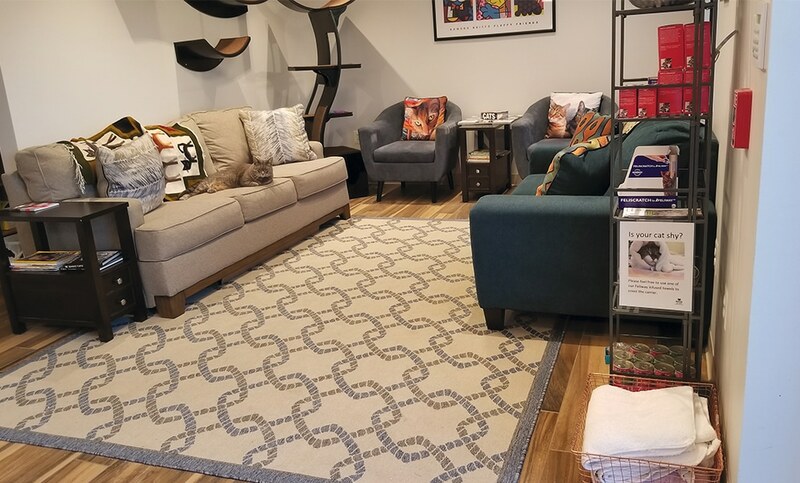 ]In 2002, she joined NOVA CAT CLINIC, an approved Gold Cat Friendly Practice, and is the LVT to a five-doctor practice and supervisor to an assisting staff. She also runs the Chris Griffey Memorial Feline Foundation, which is dedicated to helping other rescues and shelters with the critical neonatal and pediatric patient. Ellen lectures on the critical feline neonate and also safe restraint and anesthesia techniques. Welcome to a series of articles, presented in partnership between NAVC Publishing and American Association of Feline Practitioners (AAFP). These articles focus on feline-specific information on cats’ unique behaviors; diagnosis and evaluation of disease and conditions; better approaches and techniques for cats; and strategies to decrease stress associated with the veterinary visit for cats, caregivers, and your team. Offering a box to hospitalized or boarded cats reduces their stress level. While cats are considered domesticated, they are still creatures of prey and predation and constantly on guard, especially in a new environment. The veterinary office environment is uniquely stressful for cats because of the excessive sensory stimulation that occurs. One of the crucial factors in having a successful encounter with cats is understanding feline body and facial language. The veterinary nurse is key in early body language interpretation and subsequent preparation for the exam, which can make the experience easier for everyone involved, including the clients. With positive experiences, clients are more apt to continue to bring their cats for preventative healthcare checks. Body Language: Their ears are erect, pupils are normal size to slightly dilated, they may be talkative and will often show affection. They will “head bump” or may “slow blink” and expect that recognition to be reciprocated. These cats enjoy everyone! Management Approach: It is best to still take time to observe their body language and handle them gently and respectfully as their comfort level may change rapidly depending on what is happening. FIGURE 1. This cat’s flattened, or “airplaned,” ears are an early sign of frustration. Personality: These patients can sometimes be unpredictable because of the unfamiliar environment or previous negative experiences at the veterinary practice. Body Language: Their ears may “airplane” (FIGURE 1) at times (showing that they are alert and aware of their surroundings) and may show nervous affection or displacement grooming behaviors. Management Approach: Work slowly but deliberately; talk in a soft, calm manner and avoid direct eye contact. 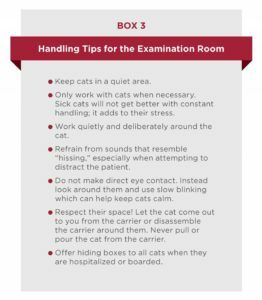 Use gentle handling and keep one hand on the cat throughout the examination instead of repeatedly moving hands on and off again as this can cause anxiety in the cat. Personality: These cats need a few minutes to warm up or acclimate to the new environment and to strangers handling them. Body Language: They will avoid eye and physical contact at all costs. They prefer to be invisible, so allowing them to hide will help keep them feeling calm and in control. Management Approach: Allow the cat to have some time and space. Take care to work with them slowly and provide these cautious cats with an opportunity to hide or “disappear” under lightly draped blankets or towels. Conduct the examination in the bottom half of their carrier whenever possible. This reduces the disruption to the cat and the amount of handling. Personality: These cats are scared and always on guard. They can easily turn into a “terrified” cat. Body Language: With these cats, their ears are planed out to the sides, eyes are dilated, and they may vocalize to let you know that you are invading their space. Management Approach: Do not make direct eye contact with these cats as that will only escalate their fear. Keep physical contact and any visual or auditory stimulation to a minimum and move very slowly around the cat. Drape a towel sprayed with feline facial pheromone (FFP) analogue sprays, such as FELIWAY Classic® (feliway.com) over the carrier so the cat can hide and feel safer. 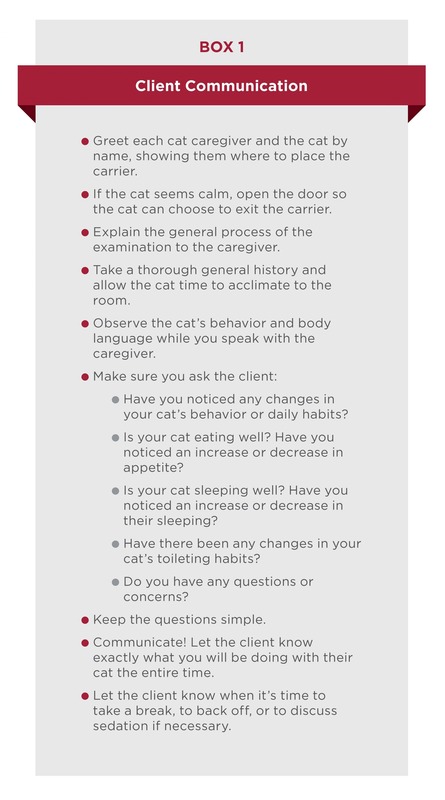 Communicate with the client and attending veterinarian that this cat is fearful and formulate a plan for the best way to examine and treat the cat. Be prepared to stop this examination and take frequent breaks, as needed. FIGURE 2. A fully-aroused, terrifed cat has characteristic body language. 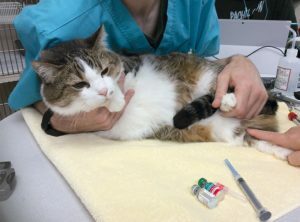 Personality: These cats feel like their life is in danger so there is need to protect these patients from self-harm, as well as the staff and pet owner when working with them. 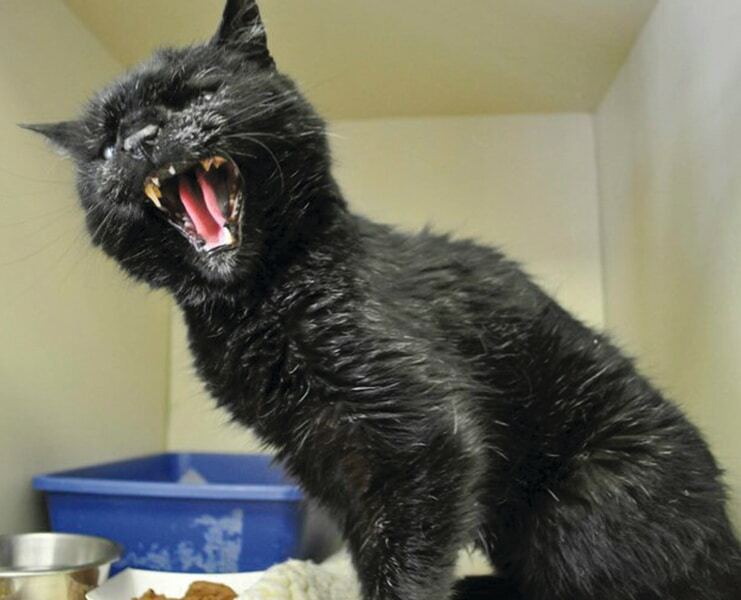 Body Language: This type of patient tends to be very vocal, often with open mouth hissing or screaming. They are in full arousal with their ears flattened, eyes fully dilated, and they may strike from the carrier. They may even urinate and defecate out of fear (FIGURE 2). 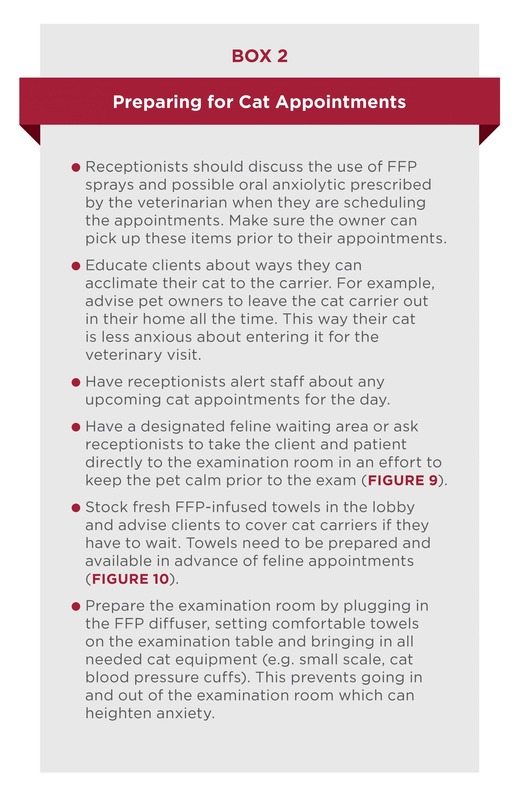 Management Approach: Cover the carrier with an FFP-infused towel, gather information from the client, and formulate a plan with the veterinarian. A patient of this caliber needs an anxiolytic and potentially a sedative of varying degrees to help reduce their stress and keep everyone safe. Nothing further can be done with this cat for a minimum of 45 minutes, if at all. 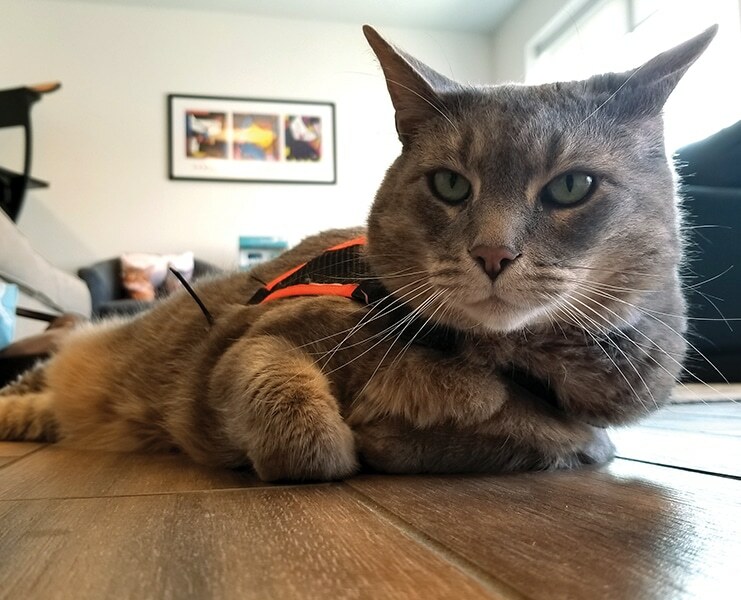 Note that this cat’s terror could have been reduced or prevented with appropriate signal recognition, carrier training and earlier anxiolytic intervention. Instructions at discharge to help manage future visits are encouraged. FIGURES 3 and 4. 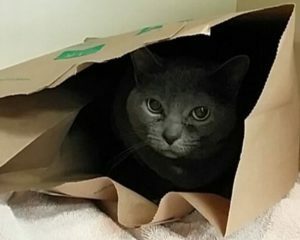 Hospitalized cats are under persistent stress, which can be alleviated by providing a hiding area. Cats have sensory overload when they are at the veterinary practice. Everything is exaggerated in size, sound, and smell. Try catering to their uniquely acute senses by reducing any auditory and visual stressors, taking care to work quietly around all cats. Provide hiding boxes in the examination room, hospitalization ward, and boarding area (FIGURES 3 AND 4). 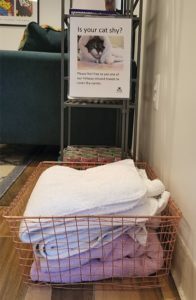 Olfactory benefits of using FFP-infused towels to cover the carrier or FFP diffusers in rooms where cats stay (including the lobby and boarding) can also help to reduce their stress. Changing scrub tops between patients, especially when working with dogs or other species, can be beneficial as cats can detect the stress pheromones and scents from another animals. FIGURE 5. Feline-friendly handling techniques, such as the “cuddle hold,” allows easy access for venipuncture. Handling can be a challenge with a cat who needs their space respected or who is head or upper body shy. Veterinary nurses should refrain from jugular or cephalic venipuncture in these patients and utilize feline-friendly handling techniques. 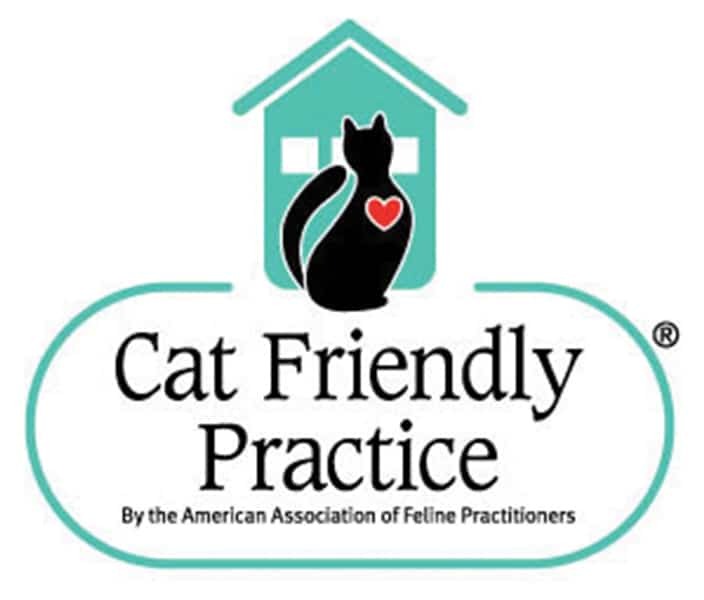 The AAFP has written complimentary Feline-Friendly Handling Guidelines and provides a RACE-approved feline-friendly handling webinar for the veterinary professional.5 There are other gentle handling techniques available, but the AAFP’s is specific for cats. The veterinary nurse should be familiar with the variety of available techniques, understanding that each patient is an individual and handling plans should be customized to that patient. Two standard restraint techniques are the “cuddle (or snuggle) hold” (FIGURE 5) and the “purrito” (FIGURE 6). Be aware that most cats by the time they have reached their adult years have some degree of arthritis, and restraint needs to be modified so as to not cause pain.5,6 For many cats, less is more and snuggling or cuddling may increase, rather than decrease fear, anxiety or stress. FIGURE 6. 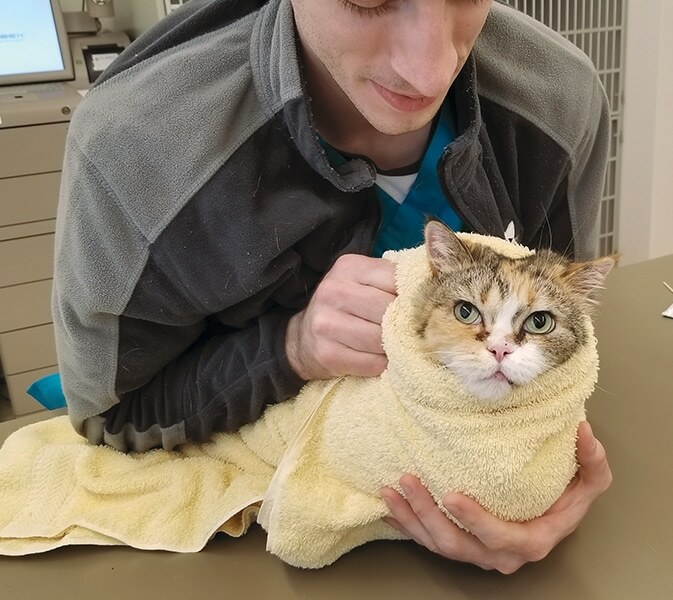 The “purrito” involves wrapping a towel snuggly around the patient. If you see signs of stress or resistance from the cat, such as panting, soiling, escape attempts or panic vocalization, immediately STOP what you are doing. Allow the animal to rest and their stress to lessen. Situations of this caliber require the entire team to reassess the situation, formulate a better plan, and discuss modes of sedation to alleviate the cat’s stress. It is widely accepted that acute stress can result in cardiac arrest if underlying cardiac or respiratory disease is present.7 It is important to remember the patient comes first; our tasks come second. When feline patients are admitted to the hospital, they can pose a risk to themselves and the medical staff working with them. These cats are under constant stress and special care should be taken to reduce it.8 Remember that working with frightened cats adds to negative emotions and can prevent them from having a positive outcome, making the pet owner reluctant to seek out future care. or using privacy curtains made from towels or pillowcases can help reduce stress. FIGURE 7. Paper bags are an easy and disposable hiding space for hospitalized cats. Minimal handling during the hospitalization period is important for keeping cats’ stress load in check.8 Work within the cubical or cage provided to administer any needed medication and keep monitoring of vitals to a minimum, unless they are a critical patient. When cats need to be removed from their kennel, some cats may need a towel gently placed over them so they can be scooped up from the kennel (FIGURE 8). The veterinary nurse should never attempt to remove the patient by reaching in face-first. Cats interpret this as a threatening sign and predatory behavior. Instead, rotate at an angle and remove the cat standing semi-sideways. If at any point the cat gives negative feedback by striking, attempting to bite, or lunging, take a break. Consider covering the cat first with an FFP-infused towel for several minutes or utilizing a sedative such as propofol in an intravenous line to sedate the cat to effect and then gently remove the cat from the kennel. FIGURE 8. 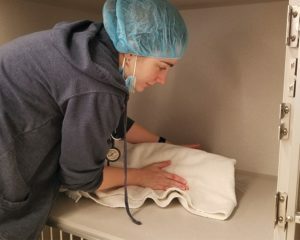 Note the towel over the patient and the angle that the veterinary nurse is standing as she removes a stressed cat from a kennel. Working with cats does not have to be a chore, but they do present some challenges to many practices. Learning why cats act as they do and how to adjust handling and management techniques can make all the difference between a positive experience and a negative one for everyone involved. FIGURE 9. 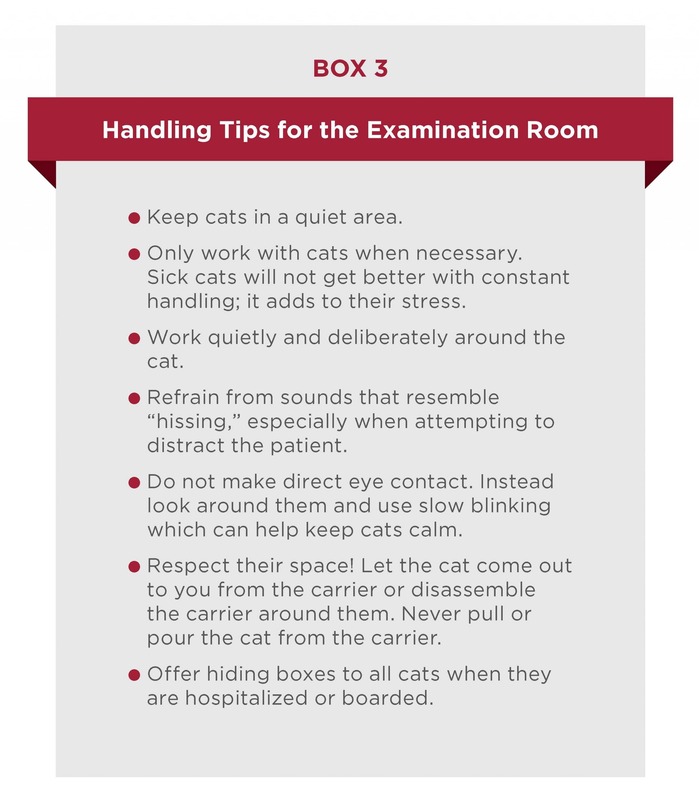 A cat-friendly waiting room can keep cats calm prior to the examination. FIGURE 10. A basket of FFP-infused towels is available for clients to cover the cat carriers while waiting. Volk JO, Felsted KE, Thomas JG. Executive summary of the Bayer veterinary care usage study. JAVMA 2011;238(10):1275-1282. Karsh EB. The effects of early and late handling on the attachment of cats to people. In: Anderson RK, Hart BL, Hart LA (eds). The pet connection. St Paul: Globe Press, 1983: 207–15. Nibblett BM, Ketzis JK, Grigg EK. Comparison of stress exhibited by cats examined in a clinic versus a home setting. Applied Animal Behaviour Science 2015;173:68-75. AAFP. 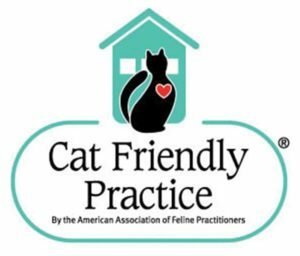 Cat Friendly Practice® 2017 Survey Results. 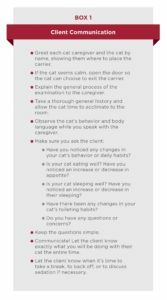 www.catvets.com/public/PDFs/CatFriendlyPractice/2017-CFP-SurveyResults.pdf. Accessed May 2018. 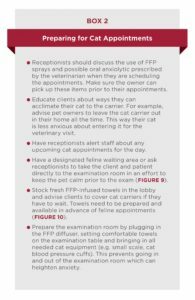 Rodan I, Sundahl E, Carney H. AAFP and ISFM Feline-Friendly Handling Guidelines. Journal of Feline Medicine and Surgery 2011;13:364–375. Robertson SA. Osteoarthritis in cats: What we now know about recognition and treatment. Veterinary Medicine. November 2008. Parry NA. Sudden and unexpected death in small animal patients: Part 1. UK Vet 2008;13(8):1-6. Carney HC, Little S, Brownlee-Tomaso D. AAFP and ISFM Feline-Friendly Nursing Care Guidelines. Journal of Feline Medicine and Surgery 2012;14:337–349. Anesthetic Gases: Guidelines for Workplace. Exposures.osha.gov/dts/osta/anestheticgases/#F4. May 2018.